Hollybeary Creations : National Craft Month Blog Hop! National Craft Month Blog Hop! 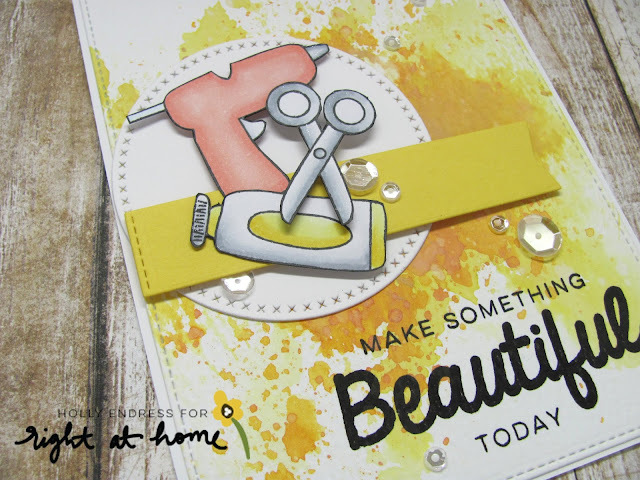 Happy Thursday everyone.. We are celebrating National Craft Month and the release of Nicole's newest set Make Something Beautiful at Right at Home with a Blog Hop!!! 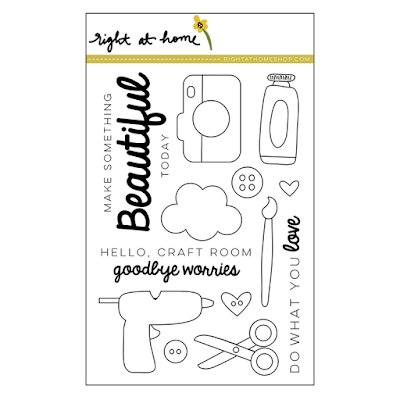 This is a Fun set perfect for all those crafter's in your Life!!! I created a background with some Distress Oxide Inks and then I used a stitched rectangle die cut to cut it out. I adhered it to a White Card base. Then I stamped the images onto some Copic friendly paper and colored them in with Copics. I fussy cut the images out and set them aside. I die cut a White circle and adhered it to the card front and then I stamped the sentiment in the lower corner with some Black ink. I added a yellow Banner with some foam tape for height and the images with foam tape as well. For a touch of sparkle I added some Clear Wink of Stella to the images and a few Sparkling Clear Sequins from Pretty Pink Posh. Would you like a chance to Win this set? Hop along with us and be sure to leave comment along the way for a chance to Win your own! Nicole will pick a Winner on Friday April 7th! Beautiful card - love the background you created. Such a fun set! This is wonderful! Love that inky background! Very pretty card. Your fussy cutting makes it outstanding! Super cute stamp set! Great card! Thanks for sharing! Lovely card!Love the color combo!Thank you for sharing! I love that background. Cute card! Fabulous card!! 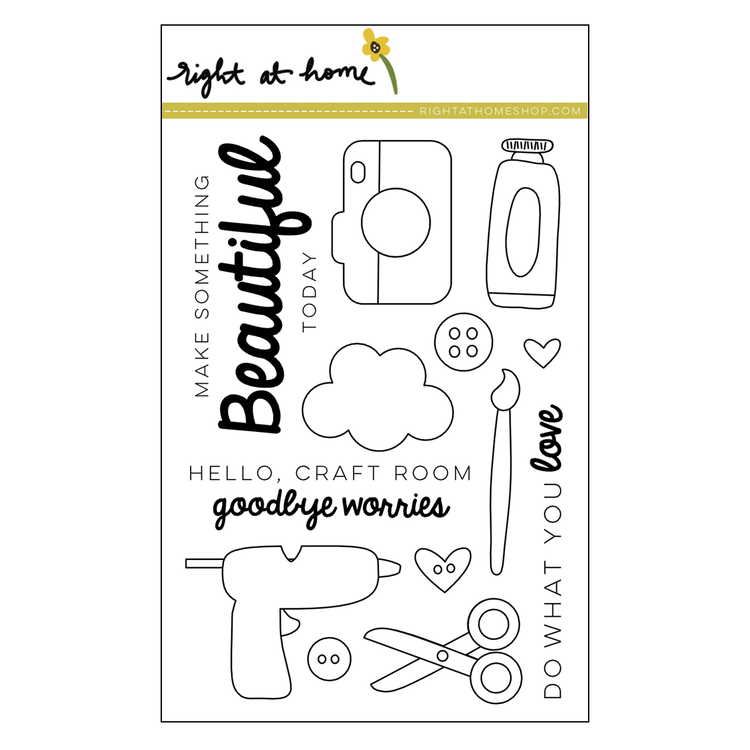 Love the background you created and that perfect cluster of crafty supplies, die-cuts, and sparkle!!! Wow! Just found your blog with the hop. I love your style and this is the perfect set for clean and fun! What a fun card and my favorite color is yellow! Oh wow, what a fun set and lovely card! Love your color choice and coloring skills which add dimension to these cute images. And your blog name is cute and reminds me of a friend named Holly Berry. So many fun images in this set...love the inked background. some stamps for our passions. Cute set and card. Think I need to order this!! Wow! Such a lovely and funny card!! !